Despite the fact that the power sector is the largest industrial water user, most countries don’t mandate that power plants disclose their water use. 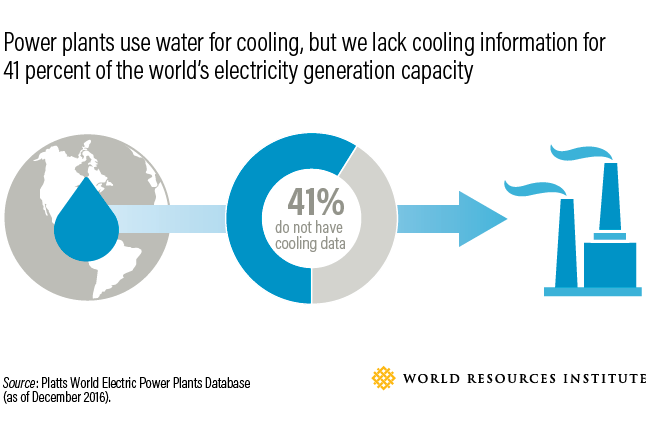 Power plants use water for cooling primarily, yet the World Electric Power Plants Database (one of the most commonly used repositories of global power plant information) has cooling data for only 59 percent of the world’s electricity generation capacity. It’s a dangerous information gap for everyone from investors to consumers. Water-dependent thermal power plants generate the majority of the world’s electricity—more than 81 percent. These plants use fuels such as coal, gas or nuclear energy to make heat, which is then converted into electrical energy. For most thermal plants, large volumes of water are a crucial part of the process, cooling high temperatures and powering turbines with steam. As demand for energy rises, the power sector’s water usage is expected to increase even further, straining scarce water resources. Thirty-six countries around the world already suffer from high or extremely high water stress. We’re already seeing this tension play out in drought-prone countries, many of which have experienced losses in power generation solely due to water shortages. For example, in 2012, record droughts in the United States caused at least one plant in Connecticut to suspend operations. In India, WRI found that water shortages in 2016 cost the country enough electricity to power neighboring Sri Lanka for an entire year. In order to mitigate power sector risks, incentivize water-wise technologies and promote policies that boost resilience, it’s important to know where lost electricity due to water shortages is most acute. Identifying which plants use the most water and the level of local competition for water (“water stress”) are critical first steps. Yet disclosure of power plant water usage is not mandated in many countries—including some of the most water-stressed ones, such as India. This data gap has hampered accountability, leaving policymakers and civil society groups without accurate data on the amount of water withdrawn and consumed by power plants across the world – water that may compete with agriculture and municipal uses, or come from stressed sources. It also prevents investors from accessing the information needed to properly assess their exposure to environmental risks. Since many power plants do not disclose their water usage, WRI has developed a method to estimate this data ourselves. The new methodology details the distinct visual features of fuel and cooling type at each thermal power plant, which can be spotted via mapping services like Google Earth. 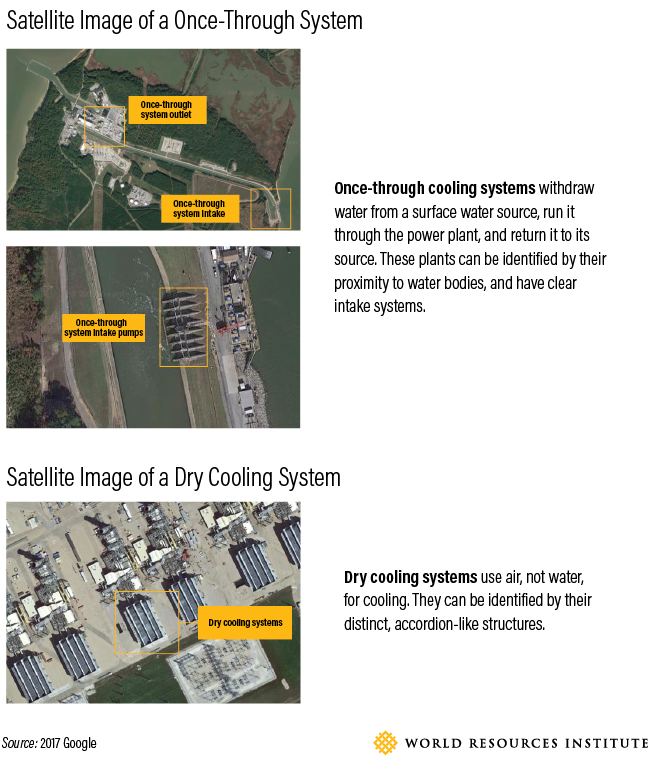 Once one identifies a power plant’s fuel and cooling types via satellite images, they can be matched to empirical water withdrawal and consumption intensities. Those intensity factors are then utilized in combination with generation data (which, unlike water usage, is usually disclosed) to calculate roughly how much water a plant withdraws or consumes over a certain time period. Anyone with internet access can use this process—governments, companies, investors and journalists can all employ this method to start assessing power plants’ water use. Empowered by transparent data, stakeholders can hold power plants accountable for their water use, and demand the adoption and development of more water-efficient technologies and policies. Ultimately, we need power plants to start disclosing their water-use data directly. This methodology provides a stand-in in the meantime. Once all thermal power plants – and someday, all water users—disclose their usage, we can take more meaningful and targeted steps to addressing growing water stress. LEARN MORE: WRI researchers are currently piloting this methodology in India, where water shortages have historically limited power generation. Stay tuned for our forthcoming research paper later this month.